Here is a summary of the research that makes the point that women are better for the environment than their male counterparts. 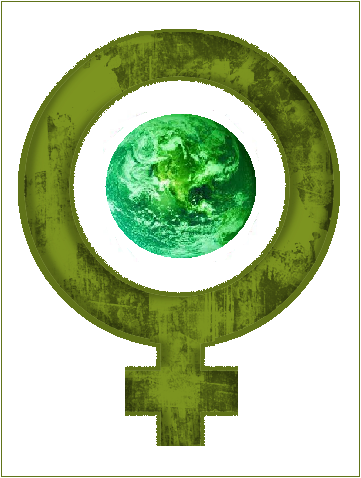 According to Hansa-GCR women decision makers in business are more environmentally-conscious than men. The Center for Women's Business Research (CWBR) released a brief called the "Environmental Consumerism Among Women Business Owners,” that reported the environmental friendliness of a product does have a moderate to major influence on the purchasing habits of 77% of women decision-makers in business. According to a 2010 study by Tiller, more women than men said they would make a green New Year's resolution. The study shows that women are more likely than men to experience "green guilt," as the poll calls it--41% versus just 27% of men. As a result, women are more focused on following through with their green resolutions (52% will "very likely" adopt green habits in 2010, as opposed to 33% of men). About 41 percent of women compared to 27 percent of men cite eco-friendly living as a daily goal, a national survey finds. The same study showed that more women than men want to use reusable shopping bags and women reduce their household’s energy use. Women are more likely than men to buy eco-oriented or recyclable products, according to an international study. This is significant because research indicates that women make at least 75 percent of home purchase decisions. Women are the driving force behind two-thirds of households that regularly recycle. According to a 2009 survey. women also do most of the housework and therefore most of the recycling. According to a 2009 report, State of World Population, women respond more positively to environmentally friendly advertising. Women buy more environmentally conscious fashion design than men. The eco-fashion movement is big in women’s apparel. Women's clothes are also smaller requiring less resources. Women consume less meat and processed foods than men. According to two European studies – two categories of food that are especially resource-intensive. Women eat more fruits and vegetables, which use up less land, water and CO2. Men drive and fly longer distances for their jobs, the European studies show. Women use more public transportation, which lessens their carbon footprint. Aggressive driving lowers gas mileage by 33 percent on the highway, says the U.S. Department of Energy, and studies repeatedly show that women drive slower than men and are less likely to speed than men. Today everyone aspires to do everything possible to help our planet, our lives and the future of generations to come. People today are conscious of the ecological impact modern living has on nature and on societies and its no wonder abundant laws exist to monitor our environmental course.